To fully appreciate what you can achieve with good planning and organisation, you need only look at Todd Mellett. Despite having been a full-time graduate student at the University of Pittsburgh in the US state of Pennsylvania, he was also a key part of a team which built a racing car from scratch not once, not twice, but three times, to compete in a string of international competitions. All that work paid off after graduation when he secured a position at one of the biggest and certainly most iconic car companies in the world – Ford. And guess what helped him and his team accelerate in the fast lane of project management? MindGenius. Todd was part of the Panther Racing team at the university which participated in a number of ‘Formula’ design and manufacturing competitions for students established by the SAE (formally known as the Society of Automotive Engineers). The team, with Todd as the project manager, designed and built racing cars for not only Formula SAE Michigan, but also for Formula Student Austria and Formula Student Germany. It was at Germany’s legendary racing circuit Hockenheimring that the team would find their greatest victory. But first they would need to revolutionise how they approached project management. When Todd joined the team, it became clear that there was great potential to save time and energy from the process of designing and building the cars. The answer was to plan and track work more effectively. “My background was in industrial engineering so I was very process orientated. When I joined the team I noticed that it was disorganised. Communication wasn’t great and there wasn’t a great deal of organisation. The design and manufacturing people weren’t working together. “At the time the team president came to me to ask what we could do to make things more efficient. I looked at various software packages, and found that MindGenius does everything we were looking for – to plan and organise big processes and develop well-thought-through Gantt charts. “I found MindGenius intuitive and easy to learn quickly. We were able to download it and hit the ground running right away. A lot of software packages have cumbersome user interfaces which are difficult to work with and which take a lot of time to learn, even if you are very capable. We needed something to that we could start using right away. MindGenius gave us that ability. We could just get it and go. And I liked the level of support that came with it. As he quickly mastered the software, Todd became the de facto project manager, and things started improving. 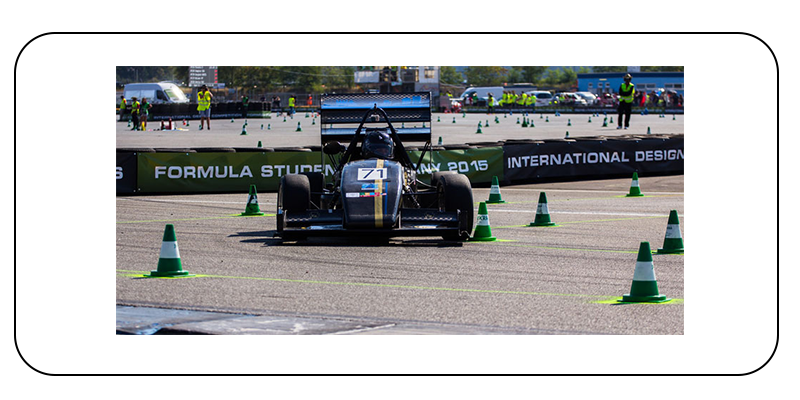 The university has had a team competing since 1994, but every year it starts from scratch to design and build around 1,000 components that will form the final car. The team first turned to MindGenius to start the process in 2013. “We started writing down every component system in the car, from the high level down, breaking the car into as many sub-systems as possible. We then used the Gantt chart feature to map out how long it would take to create each component, and what components were needed before others. We were then able to create a critical path, to understand what systems, and which had the longest lead time. MindGenius did a really good job of illustrating these. In the past, the team just worried about components when they got there, and it was apparent that couldn’t be done any more. We needed to think about the components with the longest lead time early if we didn’t want any delays. Despite fierce competition (the Pittsburgh team of around 30 were up against well-resourced German teams, one of which had up to 300 participants) the team managed to secure a prize for endurance at Germany’s Hockienheimring track in 2015. The car drove 22km without repairs. Not every car manages it. “That was a big moment for us,” Todd explained. In fact, the awards ceremony afterwards would not only mark the success of the team, but it was also the culmination of Todd’s time at the university and on the project team. But that wasn’t the end of the reasons to celebrate. After graduating and the competition in Germany, it wasn’t long before Todd was able to use what he learned on his Masters of Science, Mechanical Engineering and Masters of Business Administration programmes, and, crucially, on the racing car project, at Ford Motor Company.